I learned of this game from adverts on TV, they were sponsoring all the shows I watched apparently, the adverts made the game look really nice and so I got it on rental. 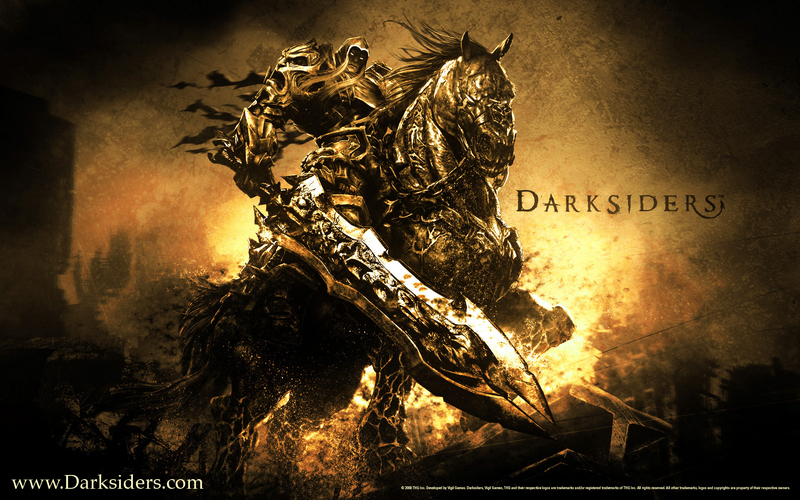 The first thing needed to be said about Darksiders is that the game’s title floats entirely on it’s own, no reference is made in game to “Darksiders” and it really doesn’t describe any part of the game. Secondly this game is not really a God of War copy, a lot of people seem to think that because the fighting is similar the rest of the game is the same, but it’s not, if I had to liken Darksiders to another game it would be Zelda. Same kind of dungeon/room setup where you have to work your way through puzzle type rooms and fight the bad guys until you get to the boss and kill it, but the similarities end there, read on for more Darksider crap. 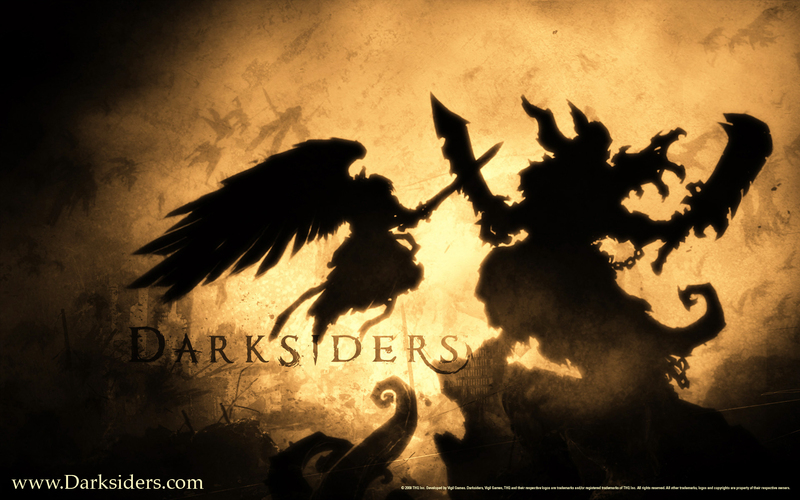 The game starts with you thrust into the apocalypse, demons and angels are raining down from the skies hell bent on destroying each other and pretty much everyone on earth, you control War, one of the four horsemen who is on neither side. You fight some angels, you fight some demons and then get smooshed by a really big demon. After that there’s a pretty long and boring cut scene informing us that somehow War has broken some seals and set about the apocalypse early and as punishment you must return to earth and annihilate the bad guys. Oh and all of the angels want to kil you because they for some reason think you killed one of their top brass or something. 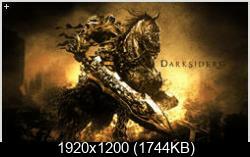 And it’s 10 years later! By this time the earth is pretty much in ruins and a giant demon fest, you have to fight and puzzle your way through dungeons full of bad guys to collect the hearts of large demons to give to another demon who will lead you to the bossman demon… Yea… It’s a little strange. There really isn’t a lot of story development through the dungeons, you just hack and slash and learn a lot of minutia but no real plot. 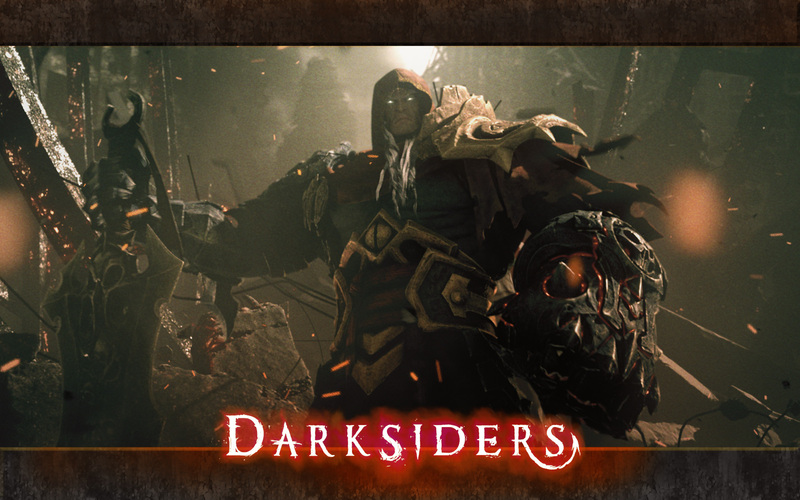 Graphics wise Darksiders isn’t going to be winning any awards, it’s the standard graphics level for this generation, combat effects are nice, enemies look pretty good but the scenery for the most part is pretty bland. 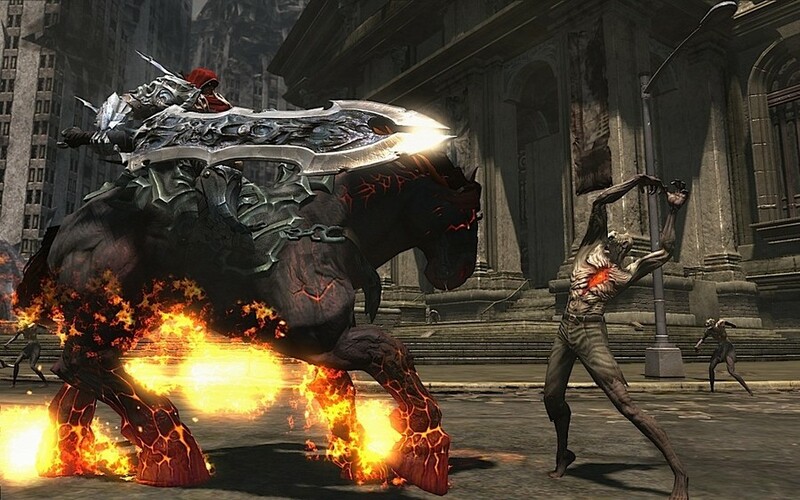 Most notably War is very detailed and colourful, as are his weapons and his horse, ruin. Being mainly confined to subterranean rooms and… Subways there isn’t much scope for beauty. The combat system is pretty simple and basically anyone can pick it up in a few minutes, to start with you’ll basically be hammering the X button until you get more weapons and more abilities, but they mainly consist of hitting X or Y repeatedly. That’s not to say that combat is boring, it’s nice to have a simple system where you can pull off a lot of different moves pretty easily and knock the living snot out of a bunch of demons. The addition of different weapons along the way keeps the combat fresh and interesting. There are also a bunch of limited use weapons you can pick up off enemies, they are generally big and overpowered, my favourite is the big shard gun which fires remotely detonated explosive shards. Again it adds more variety to the combat and gives you some truly overpowered moments. Also of note is Ruin, War’s horse, once you get him back there’s some nice horse riding scenes and some action again reminiscent of Zelda. The puzzle aspects of the game for me were a little underwhelming and not always completely obvious what I had to do, in this way it diverged away from Zelda like play as sometimes I would enter a room and not know whether to explore, puzzle or if it was a dead end. At least in Zelda most of the puzzle rooms locked so you knew you weren’t wasting your time. I wasted a lot of time in this way, some of the puzzles were just too fiddly and other times the controls seemed to want to have a mind of their own when doing puzzles. This area really needed more effort, something a little more obvious and entertaining. 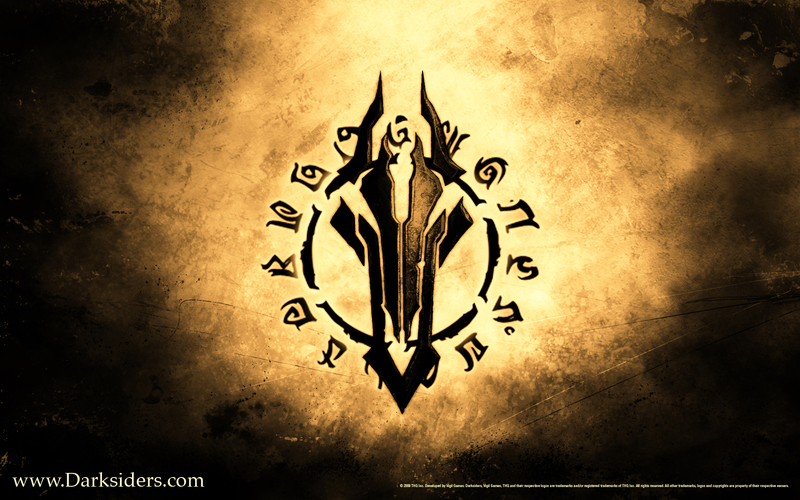 There’s really not much else to say about Darksiders, it is an adequately engaging action game combining exploration and puzzling, the story may be lacking any kind of substance and awe but after a little while I found myself quite enjoying the game, quick time events are actually useful and the combat is good enough to continue to engage and although there are some lulls in the exploration part where you’ll be doing nothing but running/swimming around it always seems to pick back up. It’s definitely worth a rent and play through.